One of the most common concerns of reef aquarists is pH. Some aquaria have pH that is too high, some too low. Some have pH just right, but don’t know it. The first step in solving this Goldilocks problem is to ensure that you are measuring pH correctly. The two primary ways of measuring pH in aquaria are using pH kits, and using pH meters. This article describes how pH meters work, how to select one to use, and how to best use it to measure the pH of a reef aquarium. In a previous article I detailed how to solve most common pH problems.1 Some of the introductory sections below were taken from that article (in a simplified form). But for details on how to solve pH problems, the original article should be consulted. Since this article combines sections that range from simple and practical to detailed and theoretical, the Table of Contents below may help those who are only interested in certain aspects of pH meters. where γH is simply a constant (the activity coefficient; γH = 1 in pure fresh water and ~0.72 in seawater) that we can also ignore for this purpose. In a sense, all that most aquarists need to know is that pH is a measure of the hydrogen ions in solution, and that the scale is logarithmic. That is, at pH 6 there is 10 times as much H+ as at pH 7, and that at pH 6 there is 100 times as much H+ as at pH 8. Consequently, a small change in pH can mean a big change in the concentration of H+ in the water. Additionally, the effect of pH on organisms can be direct, or indirect. For example, the toxicity of metals such as copper and nickel is known to depend on pH for some of the organisms present in our aquaria (such as mysids and amphipods).8 Consequently, the ranges of pH that are acceptable in one aquarium may be different in other aquaria, even for the same organisms. Nevertheless, there are some fundamental processes taking place in many marine organisms that are substantially impacted by changes in pH. One of these is calcification, and it is known that calcification in corals is dependent on pH, with it dropping as the pH is lowered.9-10 Using these types of information, along with the integrated experience of many hobbyists, we can develop some guidelines about what is an acceptable range for reef aquaria, and what values are pushing the limits. That the alkalinity is at least 2.5 meq/L, and preferably higher at the lower pH end of this range. In part, this statement is based on the fact that many reef aquaria operate quite effectively in the pH 7.8 to 8.0 range, but that most of the best examples of these types of aquaria incorporate calcium carbonate/carbon dioxide reactors that, while tending to lower the pH, keep the carbonate alkalinity fairly high (at or above 3 meq/L.). In this case, any problems associated with calcification at these lower pH values11 may be offset by the higher alkalinity. That the calcium level is at least 400 ppm. Calcification becomes more difficult as the pH is lowered, and it also becomes more difficult as the calcium level is lowered.11 It would not be desirable to push all of the extremes of pH, alkalinity, and calcium at the same time. So if the pH is on the low side and cannot be easily changed (such as in an aquarium with a CaCO3/CO2 reactor), at least make sure that the calcium level is acceptable (~400-450 ppm). Likewise, one of the problems at higher pH (above 8.2, but getting progressively more problematic with each incremental rise) is the abiotic precipitation of calcium carbonate (resulting in a drop in calcium and alkalinity, and the clogging of heaters and pump impellers). If you are going to push the pH to 8.4 or higher (as often happens in an aquarium using limewater), make sure that both the calcium and alkalinity levels are suitably maintained (that is, neither too low, inhibiting biological calcification, nor too high, causing excessive abiotic precipitation on equipment). Figure 1: A typical pH meter connected by a cable to a combination pH electrode. 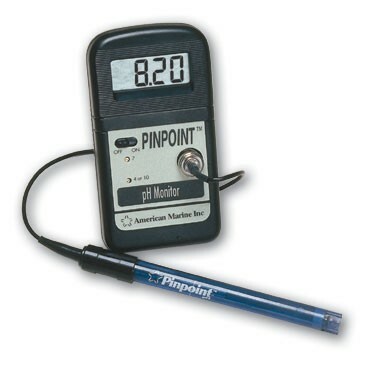 In this example, it is a Pinpoint Brand pH meter sold by American Marine. A pH meter is actually quite a complicated device. It consists of two basic parts: a pH electrode and the electronics of the meter itself. Often these are different devices attached with a cable, as shown in Figure 1 for a meter and probe sold by American Marine (Pinpoint Brand). Alternatively, less expensive models often combine the probe and meter into a single device, such as the Oakton pHTestrTM 1 shown in Figure 2. Combination pH electrodes used in both of these systems actually contain two different electrodes inside of them (hence the word combination). One is a reference electrode that does not change voltage, but just sets a standard voltage level to which the sensing electrode is compared. This reference electrode is described in more detail below. The second electrode is sensitive to pH. It is the voltage difference between these two electrodes that the meter reads and converts into pH. The usual glass pH sensing electrode consists of a nonconductive glass or epoxy cylinder with a conductive glass bulb on its end. When the glass bulb is placed into a solution it becomes more or less charged on the outside, depending on the pH. The exact details of this process are unimportant for aquarists to understand, but some discussion is provided below for folks that like to really understand how things work. Figure 2: A typical handheld pH meter where the probe is incorporated into the meter itself. In this case, it is a pHTestrTM 1 sold by Oakton. There are also other types of pH electrodes that are now available. One type, for example, involves an ion-sensitive field effect transistor (ISFET). These are fairly uncommon today but may become more common in the future. They have the advantage of being more rugged than glass electrodes, and can respond to pH changes much faster. They require power to work, and so require a special power adaptor to use with a normal pH meter. They are also fairly expensive, and not likely to be encountered by hobbyists, except in scientific supply catalogs. In preparing this article, I was frustrated that I had such a hard time understanding something that I thought should be fairly straightforward: glass pH electrodes. In the end, it appears that truly understanding pH electrodes on a molecular level is still an active area of investigation. So despite their widespread use, the detailed physicochemical processes taking place are still fairly unclear. The glass used in a pH electrode has a composition that includes certain metals in addition to the usual silicon and oxygen of SiO2 glass. These metals can include lithium, barium, lanthanum, sodium, and calcium, among others. At both the inside and outside surfaces of the glass bulb (and also in a thin (50 nm) swollen region of hydrated glass on each side), there is some substitution of H+ for these cations. How much substitution depends on how much H+ is in solution, and hence on pH. The internal pH does not change, but the external pH does, so the amount of substitution on the outer surface changes while on the inside it does not, setting up a potential difference across the glass membrane that depends on pH. How exactly this substitution happens and translates into a potential across the glass membrane is where the uncertainties begin. Mechanisms were first proposed in the 1960’s, but our understanding of the process continues to evolve today.12-16 The discussion that follows represents my marginal understanding of this complex process. Some of the oxygen atoms in the glass are not fully bound to silicon. The siloxy group that remains (Si-O-) can either be bound to a cationic metal (sodium, lithium, etc), or it can be bound to a proton (H+). When bound to a proton, it forms a neutral silanol, (Si-OH). When it is bound to other cations, it forms an ionic complex, such as Si-O- Na+ . This ionic complex, when exposed at the surface of the glass can partially dissociate into a negatively charged surface, and a positively charged “layer” of ions just off of the solid surface. This separation is shown schematically in Figure 3. This dissociation leaves the surface with a net negative charge. The extent to which this happens depends on the concentration of Si-O- Na+ and related species. Since the pH changes the relative concentration of these species, the potential is related to the pH in solution. Figure 3: A schematic diagram of a glass pH electrode. 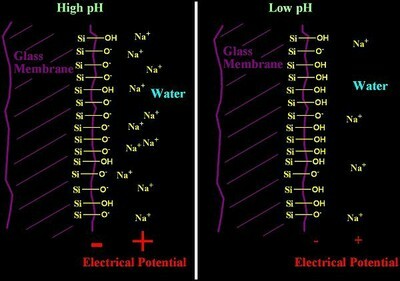 The electrical potential at the glass/water surface caused by separation of the Si-O- and Na+ ions is shown in red for both low and high pH. A voltmeter attached to the two ends of this wire would then be able to record a voltage. In this description, there is another interface on the inside of the glass membrane (where it contacts the electrode filling solution), but that one is fixed and does not respond to pH since pH is unchanging there. In reality, there is no wire. But there is an incredibly small current passing through the glass membrane. That is why the glass membrane must be somewhat conductive. The external reference electrode is really just a way of sending this tiny current out into the water being measured, through the glass membrane, and back through the internal wire of the pH sensing electrode. This is also one reason why normal pH electrodes do not do a good job of determining pH in very pure (low conductivity) fresh water: there are not enough ions to support even this tiny current. The potential for this reaction only depends on the concentration of chloride in the internal filling solution. Using a saturated potassium chloride (KCl) solution keeps the chloride concentration steady (at a given temperature), making this a good choice as a reference electrode. If the fluid filling the glass sensing pH electrode is saturated KCl (as it usually is), then the reference electrode can be kept inside of the glass shell and the electrode looks like a single unit. There are two different ways that temperature impacts pH measurement. The first involves actual chemical changes in the solution that you are measuring. Acids can, for example, become stronger or weaker as the temperature is changed. This is how calibration standards change their pH as a function of temperature (which is discussed in more detail in the calibration section below). If the solution has solids in contact with it (as is the case with saturated limewater in the presence of excess solids), the temperature can also impact how much acid or base is in solution impacting pH, and how much is just solid sitting on the bottom of the container. These effects are specific for every solution that you will encounter, and there is nothing general that one can or should do about this, except be aware that it happens. The second impact of temperature is on the pH electrode itself. pH electrodes change their response in a very clear way as temperature is changes. They respond more strongly to pH changes at higher temperature than at lower ones. At 100 ºC, they change their output potential by 74 mV/pH unit, and at 0 ºC, they change by 54 mv/pH unit. Because pH meters are typically standardized at pH 7 (that is, zero mv = pH 7), the error from temperature differences gets greater and greater as the pH being measured gets further from 7. So it may be trivial when measuring something with a pH of 7.1, but very important when measuring something with a pH of 10 (or when calibrating with a pH 10 buffer). There are usually three different ways of taking temperature into account. One is to make measurements close to the temperature at which you calibrated the meter (say, within a few degrees). The second is to “tell’ the meter what the temperature is (digitally or with a dial). The third is that some meters have a temperature probe, usually called an ATC, which you stick into the measuring solution. This probe reports the temperature back to the meter, and the meter makes any necessary corrections (for this type of temperature effect). As long as you use one of these three ways of dealing with temperature issues, you will get reasonably accurate readings. There are hundreds of different types and styles of pH electrodes. These vary in size, composition (glass or plastic sides, typically), shape, the nature of the glass membrane (even non-glass materials can be used), how that membrane is separated from the internal filling solution, (that is, single vs. double junction), whether the internal fluids are sealed or refillable, and a variety of other issues. Selecting an epoxy body electrode instead of a glass body electrode will make it less likely that you will break it by accident. The glass bulb on the tip is still very fragile (I’ve broken many), but the bulb can be protected by a plastic shield to reduce the chance of breakage. If you intend on measuring pH directly in the aquarium or sump (rather than in a cup of water removed from the aquarium), then expect to occasionally get the whole electrode wet (by accident). If it is a refillable type which has a hole for adding more filling solution (usually KCl), then you might get aquarium water into the electrode. That can severely degrade performance by messing up the reference electrode. So selecting a sealed electrode may be a better choice. Some folks argue that a double junction electrode is preferable, and that is likely true. Without going into the design details, a double junction electrode makes it much less likely that there will be any exchange of ions between the aquarium and the filling solution through the glass bulb. This option may be especially important if you are using an internal reference electrode other than Ag/AgCl. For example, if it is a calomel reference electrode, it contains mercury. It is desirable to keep mercury salts out of the aquarium due to its toxicity, so a double junction is likely preferable in that case. Likewise, it is desirable to keep sodium and other seawater ions from entering the reference electrode, and a double junction prevents that to a much greater extent than a single junction. That aspect is more important if you leave the electrode in the aquarium water than if you put in into a storage solution after every use. In general, it is likely better to have a double junctionthan a single junction, but it may not result in appreciably better measurements. There are other attributes of certain electrodes that may make them more useful in laboratories, and hence justify prices that easily range to more than $350 for the electrode alone. There is not likely any significant advantage in using such electrodes for reef aquaria, however. Do not be worried about claims that you need a special electrode for high pH or high sodium environments. That is true for the most accurate measurements at high pH and high salinity, but aquarium water will be OK with a standard electrode, and even brief measurements at high pH (like limewater) will be fine. An electrode that I have been using for the past few years is sold by Cole Parmer. It is catalog number U-59001-70. It has an epoxy body, is sealed, and has a double junction. I’m not certain what type of reference electrode it contains, but I believe it to be Ag/AgCl. Its list price is $60. 1) Any analytical method, including measurement of pH, is best calibrated with standards that span the range expected. Most aquarists calibrate pH meters using two solutions of known pH. A meter that only allows one is a very poor choice. Using more is fine if your meter allows more than 2. When using 2 solutions to calibrate a pH electrode for use in a marine aquarium, one should optimally be below 8.0 (typically 7) and one should be above 8.5 (typically 10, but 9 is also sometimes used). If you are measuring pH in something other than aquarium water then there may be special tricks which are detailed below. Using pH 4 and 7 is often done, but can be a less optimal choice because the range expected to be measured for reef aquarium water (about pH 7.8 – 8.6) is outside of the calibration range. In some cases the error is small enough that this is acceptable. In others, it may be a problem. The tables below show the maximum errors that are attained from various errors in the standard buffer solutions themselves (with problems with the standards being the only source of error considered; in reality, there can be additional errors in real measurements). These tables were obtained by simply looking at how much the calibration solutions might vary (first column), and seeing how much the actual measured value can be off if both standards vary to the stated maximum error and in directions that result in the maximum measurement error (which turns out to be varying in opposite directions when using pH 4 and 7, and varying in the same direction when using pH 7 and 10 standards). It is clear that with similar errors in the standard solutions, the errors in the measurements at pH 8-10 are smaller when calibrating at pH 7 and 10 than at pH 4 and 7. Whether these differences are important depend on the application and expectations of the aquarist. Additionally, if you are measuring pH in a fluid of a lower pH (such as inside of a CaCO3/CO2 reactor, then calibrating at pH 4 and 7 is more sensible than calibrating at pH 7 and 10. 2) Make sure the calibration standards are either new or at least adequate for the purpose. New standards, and especially new standards in one-time-use foil packets are the best. I have several bottles of pH fluid that I have been using for years, however. Occasionally I use a fresh bottle or packet to calibrate my meter. At that time I check the pH values of all of these older bottles, and note the pH on the bottle. I can then use that bottle for future pH calibrations BECAUSE my meter allows me to calibrate with standards at any pH (such as pH 7.03 and 8.85). If your meter does not allow you to input the pH values that precisely, then you will not be able to use this trick. 3) Rinse the pH electrode in pure fresh water before putting it into any calibration standard, and between each standard. 4) It takes some time for a pH meter to get a correct reading. So let the meter equilibrate to each standard long enough that the value stabilizes (say, within +/- 0.01 pH unit for 30 seconds or longer). Some meters beep or otherwise tell you when you are suitably equilibrated. 5) Stirring the solution can help the pH probe equilibrate to the solution, but it also encourages CO2 to enter the fluid. This CO2 can lower the pH of high pH standards, such as pH 8 and greater. I stir mine for about 30 seconds (often with the pH probe itself, though I’ve also broken them this way) and then let it sit to get a reading. 6) The temperature of the standards is important for two reasons. One is that standards actually change pH as a function of temperature. The other is the pH electrodes change their response as a function of temperature (described above). The change in standard solution pH as a function of temperature cannot be automatically adjusted for by inputting temperature into the meter, or via its ATC. It is an attribute of the exact chemistry of the buffer used. Some have pH that rises as temperature rises, and some fall as temperature rises. Others rise with temperature in some temperature ranges and fall with temperature in other temperature ranges. You should be aware of the exact pH at the temperature that you are using it. Buffers will often have such pH values as a function of temperature printed on the bottle. For example, a standard phosphate buffer has a pH of 7.000 at 25 ºC, but 7.04 at 15 ºC (a small difference). At the same time, a carbonate buffer with a pH of 10.01 at 25 ºChas a pH of 10.12 at 15 ºC (a larger difference). 7) After you calibrate the meter. Go back and make sure that it reads the calibrating solutions correctly (to within whatever error you are willing to accept) to be sure that you did it correctly. 9) If you are doing certain kinds of pH measurements, direct comparison to a known standard may be more useful than using the absolute numbers that the pH meter reads. For example, if you are assessing the strength of limewater via pH. In that case, make a standard of known saturated limewater (from, for example, a teaspoon of calcium hydroxide in a cup of pure fresh water). That solution will have a pH of about 12.45 at 25 ºC, but regardless of what you get, you can use the number as the standard and see how far off from it your actual limewater is (if it is 0.1 pH unit lower, then your limewater is about 79% saturated; 0.2 pH units lower and it is 63% saturated; 0.3 pH units lower and it is about 50% saturated; 0.4 pH units lower and it is 40% saturated, etc.). In this case, exact temperature equivalence between the samples is important. A difference of only 3 ºC means a pH difference of 0.1 pH unit for saturated limewater. Measuring pH in some fashion is important for most reef aquaria. Using a properly calibrated pH meter is one of the easiest ways to accomplish this goal. Despite their inherent complexity at a molecular level, pH meters are fairly easy to use accurately. If appropriate steps are taken in using them, they will provide sufficient accuracy for nearly every reef aquarium application. Improper operation, however, frequently leads to aquarists in a panic about their aquaria, even when everything is fine, or falsely believing that everything is fine, when in reality there is a problem. Hopefully, this article will help aquarists understand and avoid these potential problems. Hydrogen-ion concentration of sea water in its biological relations. Atkins, W. R. G. J. Marine Biol. Assoc. (1922), 12 717-71. Water quality requirements for first-feeding in marine fish larvae. II. pH, oxygen, and carbon dioxide. Brownell, Charles L. Dep. Zool., Univ. Cape Town, Rondebosch, S. Afr. J. Exp. Mar. Biol. Ecol. (1980), 44(2-3), 285-8. Chondrus crispus (Gigartinaceae, Rhodophyta) tank cultivation: optimizing carbon input by a fixed pH and use of a salt water well. Braud, Jean-Paul; Amat, Mireille A. Sanofi Bio-Industries, Polder du Dain, Bouin, Fr. Hydrobiologia (1996), 326/327 335-340. Physiological ecology of Gelidiella acerosa. Rao, P. Sreenivasa; Mehta, V. B. Dep. Biosci., Saurashtra Univ., Rajkot, India. J. Phycol. (1973), 9(3), 333-5. Studies on marine biological filters. Model filters. Wickins, J. F. Fish. Exp. Stn., Minist. Agric. Fish. Food, Conwy/Gwynedd, UK. Water Res. (1983), 17(12), 1769-80. Physiological characteristics of Mycosphaerella ascophylli, a fungal endophyte of the marine brown alga Ascophyllum nodosum. Fries, Nils. Inst. Physiol. Bot., Univ. Uppsala, Uppsala, Swed. Physiol. Plant. (1979), 45(1), 117-21.
pH dependent toxicity of five metals to three marine organisms. Ho, Kay T.; Kuhn, Anne; Pelletier, Marguerite C.; Hendricks, Tracey L.; Helmstetter, Andrea. National Health and Ecological Effects Research Laboratory, U.S. Environmental Protection Agency, Narragansett, RI, USA. Environmental Toxicology (1999), 14(2), 235-240. Effects of lowered pH and elevated nitrate on coral calcification. Marubini, F.; Atkinson, M. J. Biosphere 2 Center, Columbia Univ., Oracle, AZ, USA. Mar. Ecol. : Prog. Ser. (1999), 188 117-121. Effect of calcium carbonate saturation state on the calcification rate of an experimental coral reef. Langdon, Chris; Takahashi, Taro; Sweeney, Colm; Chipman, Dave; Goddard, John; Marubini, Francesca; Aceves, Heather; Barnett, Heidi; Atkinson, Marlin J. Lamont-Doherty Earth Observatory of Columbia University, Palisades, NY, USA. Global Biogeochem. Cycles (2000), 14(2), 639-654. Functioning of glass electrodes. A discussion of interfacial equilibria. Baucke, F. G. K. Schott Glas, Mainz, Germany. Physics and Chemistry of Glasses (2001), 42(3), 220-225. On stability of glass electrode potentials. Stefanova, O. K.; Pisarevskii, A. M.; Belyustin, A. A.; Bobrov, V. S.; Lepnev, G. P.; Shul’ts, M. M. Russia. Vestnik Sankt-Peterburgskogo Universiteta, Seriya 4: Fizika, Khimiya (2000), (3), 48-57. Origin of pH-glass electrode potentials and development of pNa-responsive glasses. Abe, Yoshihiro; Maeda, Masunobu. Faculty of Engineering, Chubu University, Kasugai, Japan. Journal of the Electrochemical Society (2000), 147(2), 787-791. The glass electrode. Proposal of kinetic measurements for the development of improved membrane glasses. Baucke, F. G. K. Schott Glaswerke, Mainz, Germany. Glass Science and Technology (Frankfurt/Main) (1997), 70C(Proceedings of the Norbert Kreindl Symposium: Present State and Future Prospects of Glass Science and Technology, 1994), 369-381. III. Electrochemistry in glasses and melts. Glass electrodes: why and how they function. Baucke, Friedrich G. K. Schott Glaswerke, Mainz, Germany. Berichte der Bunsen-Gesellschaft (1996), 100(9), 1466-1474.